I love a good fair. Craft fair, food fair, furniture fair… really anything but a street fair. You know, the kind that shuts down part of Sixth Avenue when you’ve decided that’s the day you’re going to rent a zipcar and go to Home Depot or something. There is no shortage of craft/food/antique fairs to choose from in New York City. For example, I’ve blogged before about the Hester Street Fair; have spent many a happy afternoon wandering the outdoor Brooklyn Smorgasburg; there’s still the Brooklyn Night Bazaar to try out, and MadSqEats in the fall is one of my favorites for food. Two weeks ago a friend and I checked out the new winter home of the Brooklyn Flea in Crown Heights after our Brooklyn Bodyburn class, and poked our heads into the adjoining Berg’n beer hall, too. I am also highly excited for the Hester Holiday Market opening on December 1st at One Penn Plaza. Hey, sometimes I’m in midtown. Last weekend the Renegade Craft Fair came to town – it’s been here before, I’ve just always missed it in the past. Unlike some of the other markets, it doesn’t hang around. It’s here for two days and then it’s gone, so I was thrilled to finally attend, and I have to say I was really pleased to see such quality stuff, and to chat with small business owners and makers who are really excited and passionate about what they do. There was a little bit of everything – clothing for women, men, kids. Great scarves, bags, and jewelry. Really yummy bath and beauty stuff. Beautiful ceramic vases and spoon rests. And my favorite category – kitchen and tabletop goods, like tea towels, wooden spoons, cast iron pans, trivets, and aprons. You name it, someone is making it. These are some of my favorites! Enjoy. 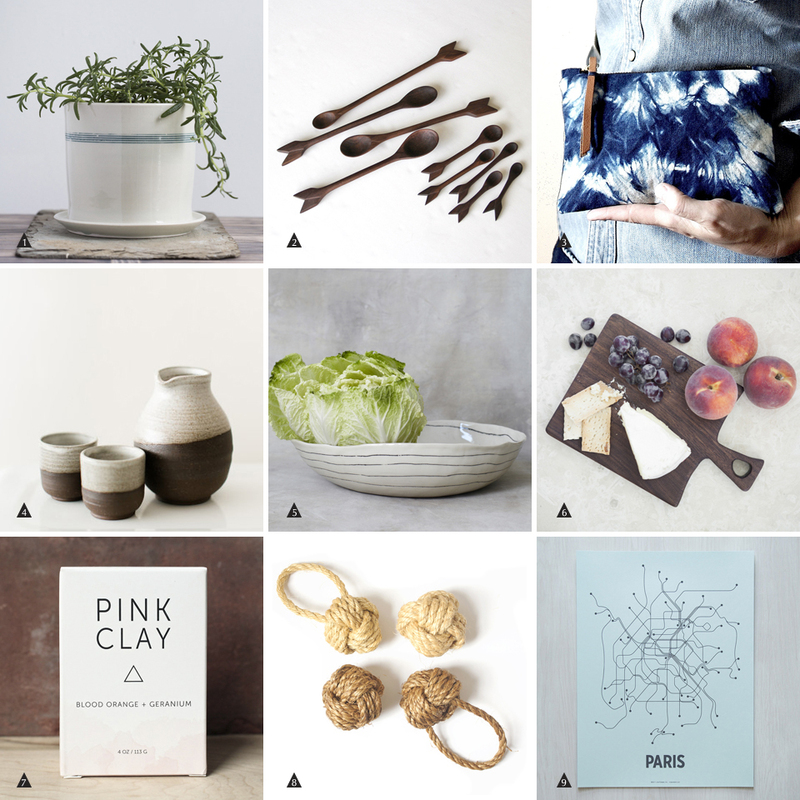 1 planters from Cara Taylor ceramics | 2 wooden arrow spoons (plus everything else) from Amelie Mancini | 3 indigo clothing & accessories from Katrin Reifeiss | 4 ceramic sake set from Soul Vessel Designs | 5 i’d like everything from btw ceramics, but this striped serving bowl is top of the list | 6 all kinds of beautiful wooden boards and serving pieces at East to West Woods | 7 Herbivore Botanicals gorgeous Pink Clay soap | 8 i love the knotted ropes from Tack & Ward | 9 city metro maps from line posters…especially the Paris one.